Spent the last two days sick on the couch. I knew I really had come down with something when I really wasn't even that interested in reading. What a missed opportunity. I mostly snuggled under the blankets fighting a horrible fever and sleeping on and off with TV in the background for some noise. Fortunately, I had a review in queue for you. I finished this one a couple of weeks ago, but it is finally getting close to releasing. I actually am found of the break from fantasy fiction on this one. It will be hitting store shelves next month. There are plenty of letters, notes, postcards, diaries, and other literary proofs of the lives of Virginia Woolf and her slightly less recognized sister Vanessa Bell. This is a story of what built around those letters. This is a fine example of historical fiction. The people are real, the events are factual, the story is fiction. The author extensively researched her subjects and Edwardian England. 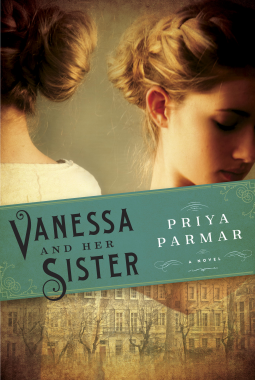 Ms. Parmar beautifully captures the essence that the sisters' letters provided and builds a full painting as if we were a part of the Bloomsbury movement. These two women were from the upper layers of British society and had a sense of entitlement to them. They were given privilege from their eccentric parents and grew to be wild, artistic bohemians who did not want to mold to convention. They wanted to shock their peers and destroy social conventions, yet rarely interacted with anyone outside their social circle. They influenced an entire movement in literature and art with their works through sheer strength of personality. Vanessa's tale is the heartbreaking side to entitled rebellion. Ms. Parmar shows how bending the rules sometimes breaks the heart. Vanessa does not want to be a part of social convention because she is surrounded by self-indulgent elitists and that is what she knows. She puts off marriage and courtship thinking she is not able to abandon her family to such traditional hogwash. The tragedy of loss and madness plagues the Stephens family and there is only so much strength one person can handle alone. When Vanessa finally finds her happiness in Clive, she blooms and radiates her glory to everyone she contacts. She is strengthened by finally having a family of her own. She realizes that she is a traditionalist for marriage and has always wanted something of her own, unspoiled by madness. Her previous Bohemian ideals have no place in her new life and when they interject themselves anyway, she is devastated. This book is very raw and real. It is not a happy-go-lucky read, but a great piece of literature. I highly recommend this for an intelligent pallet cleanse after reading too many fantasies. Would you be a Gaffer? What magician type would you be?